In 1938 Frida painted two similar paintings with the same subject. 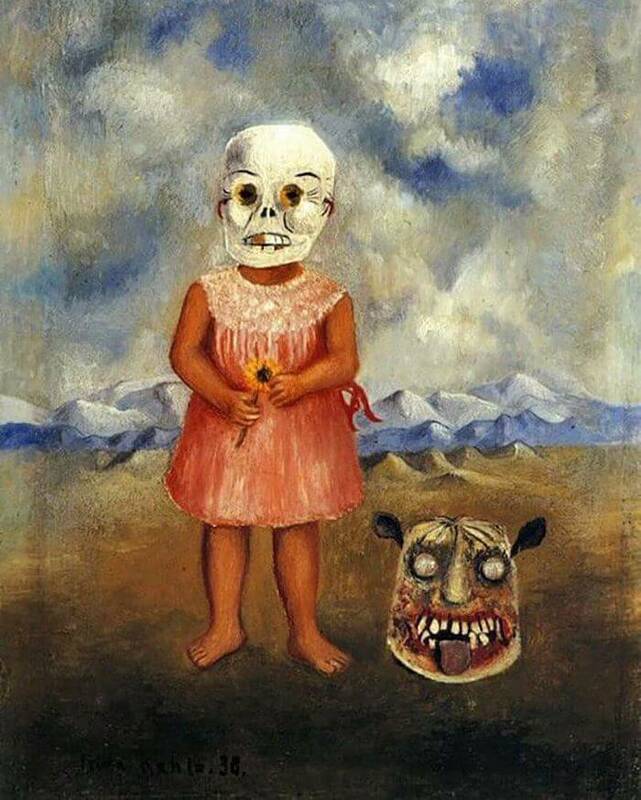 This painting depicted a little girl, which is believed to be Frida herself at age of four, was wearing a skull mask. This kind of mask is a tradition at the annual Mexican festival "Day of the Dead" where death is celebrated instead of mourned. The little is holding a yellow blossom in her hands which resembles the tagete bloom that Mexicans put on graves at the "Day of the Dead" festival. She stands on an empty vast field under a gloomy sky all by herself. By her feet there is a carved wooden tiger mask, which is a similar one hanging in the dinning room of Frida's house. Both masks seems not appropriate for the innocent tiny little girl and are symbols or hint for the cruelty of her destiny. This painting was collected by Museum of Art in Nagoya, Japan. It was originally given to actress Dolores del Rio as a gift. Later it was acquired by a private collector in Monterey, California.